The League's Matteo Salvini gives a press conference on the preliminary election results, in Milan, March 5, 2018. The big winners in Italy's election are a rival pair of populist and stridently anti-European Union political forces: the Five Star Movement and The League. But neither gained enough support to govern the country alone, confirming that negotiations will not be easy to form a new government that can win a confidence vote in parliament. Regardless, Sunday's populist victory is not good news for migrants from Africa or those trying to enter Europe through Italy as winning factions have been clamoring for measures to stop migration and increase deportations. 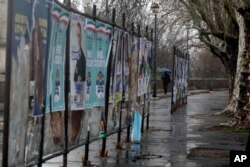 Torn electoral posters hang on billboard in Rome, March 5, 2018. As the results came during the night after the polls closed, it became immediately clear that no party or bloc would gain the 40 percent majority of seats needed in the Italian parliament to be able to govern the country. It was also clear from early on that the ruling center-left Democratic party was the big loser in these elections. Maurizio Martina, a minister in the outgoing government, said this is a very clear and evident defeat for the left. 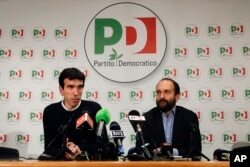 Democratic Party lawmaker Maurizio Martina, left, and President Matteo Orfini talk to journalists in the party's headquarters, in Rome, March 4, 2018. The center-left failed to convince voters with its pro-European message of gradual economic recovery while the anti-immigrant and euro skeptic League party of Matteo Salvini gained huge ground. Claudio Borghi, the League’s economic adviser, spoke of a historic result and a turning-point because from today the League has become a national party and the center-right will be led by Matteo Salvini. These, Borghi said, are two very important results. The League surpassed its coalition partner, the establishment Forza Italia party of former Prime Minister Silvio Berlusconi. 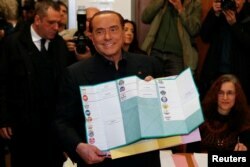 Forza Italia party leader Silvio Berlusconi holds his ballot as he prepares to cast his vote at a polling station in in Milan, Italy, March 4, 2018. Observers noted how the results confirmed the defeat of the two main political forces that have dominated the Italian political landscape for decades — Forza Italia and the Democratic Left. As the results came in, French far-right leader Marine Le Pen celebrated, saying Europe was having a bad night. Celebrating the strong showing of Italy’s League party, she tweeted: "The spectacular advance and top showing of the League coalition led by our ally and friend Matteo Salvini is a new stage in the awakening of the people!" But the League was not the only major winner in these elections. The populist and anti-establishment Five Star Movement, which did not exist 10 years ago and is headed by the 31-year-old Luigi Di Maio, obtained the highest number of votes of any single party by far. 5-Stars Movement's leader Luigi Di Maio smiles as he arrives for a press conference on the preliminary election results, in Rome, March 5, 2018. Alessandro Di Battista of the Five Star Movement, said: "Everyone is going to have to come and speak to us". He added that this will be for the best guarantee of transparency for the Italian people because the other political forces will have to come and speak with them about the proposals and solutions for the country, using their methods of transparency, correctness and credibility. 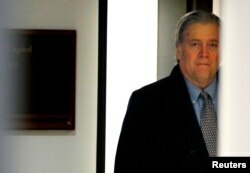 FILE - Former White House Chief Strategist Stephen Bannon arrives for an interview by the House Intelligence Committee investigating alleged Russian interference in the 2016 U.S. election on Capitol Hill, January 16, 2018. The outcome of the vote, which effectively delivered a hung parliament, paves the way for a prolonged period of political instability. The Italian parliament will meet for the first time on March 23 and President Sergio Mattarella is not expected to open formal talks on forming a government until early April.